Do you let your imagination play tricks on you? That is what inspired this artwork. 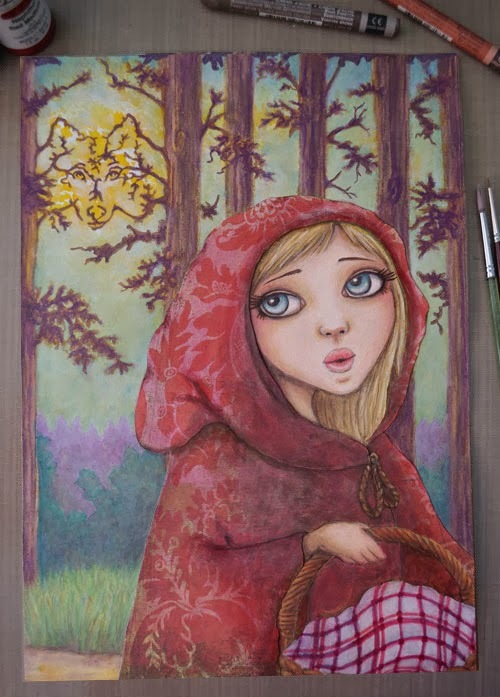 Rather than a physical wolf, I thought this piece would benefit from a little twist on the Little Red Riding Hood theme, letting her imagination run wild instead. I quite like the idea of the trees symbolising bars, trapping Red in this state of mind. 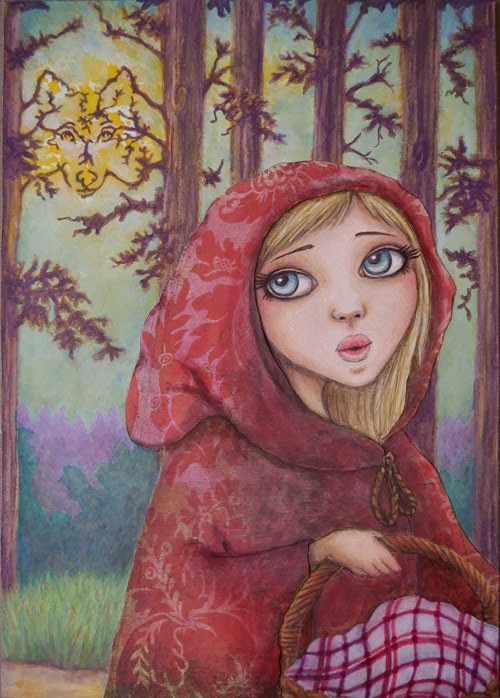 As a child, did you know the Little Red Riding Hood fairytale? Were you afraid of the big bad wolf? Maybe the story made you jump at the slightest sound or see ominous shadows in the dark, getting to the point where you let your imagination take over. It has always intrigued me on how the mind works and how our natural instinct kicks in to survival mode. This is an artwork that I started in 2013 and I promised myself to complete it along with a couple of other ones this year. 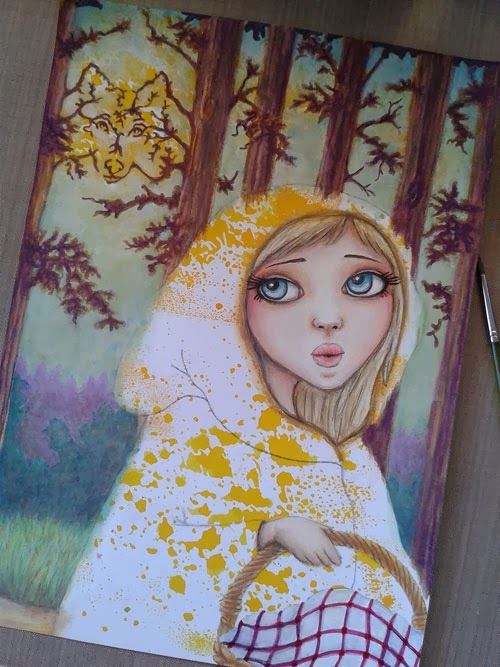 The background is left over yellow dylusions ink from a stencil that I patted onto hot pressed watercolour paper from another project. Gesso was used on the face and hand, so I would have a nice base to begin painting the skin tones on. Acrylic paint and caran d'ache watersoluble crayons were used throughout. I love the pattern on this scrapbook paper, perfect for a vintage cloak. I first trace over the drawing of the cloak and then transfer it onto the patterned paper. A sharp pointed scissors makes cutting this out an easy task. After gluing the cloak pieces in place I gave it a touch of realism with some shading. Layer after layer this artwork started to reveal itself. 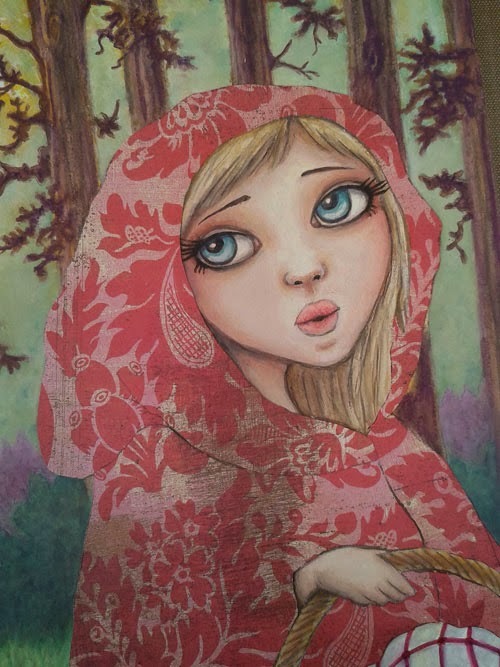 I am very happy I decided to go ahead and finish Little Red Riding Hood. After all it's not about the destination, it's about the journey isn't it? Comments are welcomed and encouraged. 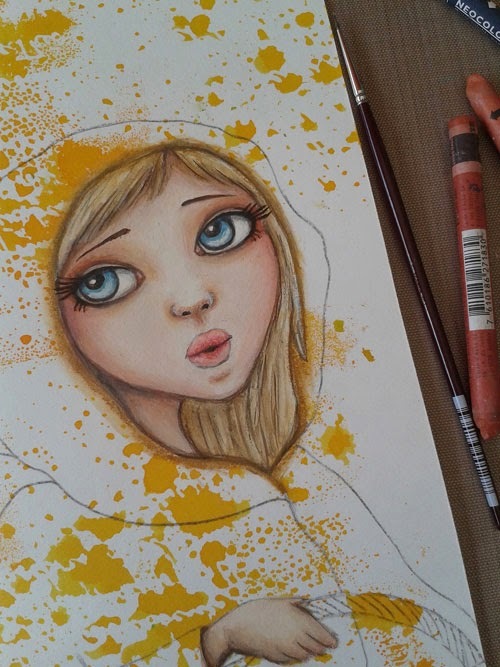 what a fabulous piece-very illustrative, I could definitely see this in a storybook. You are very talented. This is beautiful and I can not stop looking at it. You should sell prints. I love it. I would buy a print. I am very happy you like the finished artwork Jeannie. When I looked at the ink splatters on the paper, most of the yellow was in the top left corner. 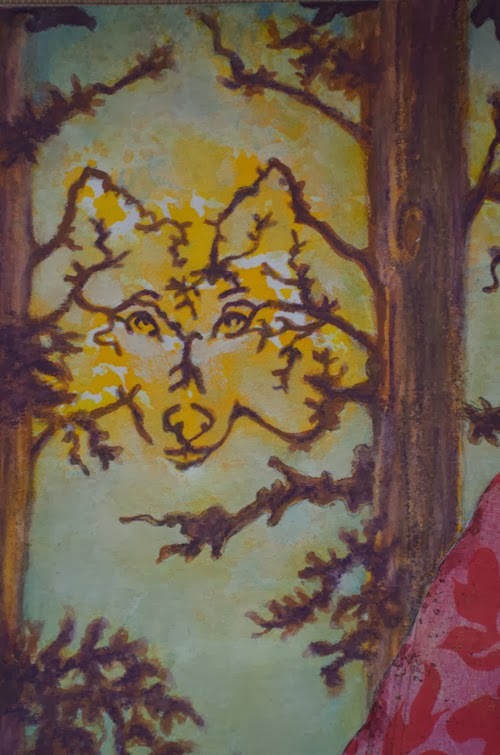 That is when I came up with the idea of the wolf in the trees with the sun starting to go down behind him. If you would like a print, just click on the "Contact Me!" tab above the Life Book button on the right sidebar and enter your details. I will be in touch with your shortly.